Moderate, Difficult navigation without map or GPS. In the 1960’s several local residents were forced to leave their homes here in the area of Big River. The State took the land by eminent domain to build a reservoir. The reservoir, first planned in the 1920’s, was never built and today the large and sprawling property is considered open space with a maze of trails, small streams, ponds, and cellar holes. With that being said, as with all of the Big River property, it is suggested not to wander here without a map, GPS device, or someone who knows the property well. For today’s hike we were led by Sandi of the Appalachian Mountain Club who guided us through the heart of Big River on a nearly five and a half mile trek. Her knowledge of not just the trails, but the history of the property is astounding. I would highly suggest keeping an eye out for any future hikes she may lead here. We started from the main parking area along Nooseneck Hill Road (a quarter mile south of Route 95). From here we followed Burnt Sawmill Road into the Management Area along the paved road until we reached a gate. The pond, with dam and waterfall, on the left is Capwell Mill Pond, fed by both the Carr River and Mud Bottom Brook. Continuing along Burnt Sawmill Road, we were flanked by old trees and telephone poles. At pole 24 a trail, an old cart path, veers to the left. We took it following the old cart path through pine groves and maples before crossing a stream at a wooden bridge that has seen better days. The trails continues, climbing a small hill, passing a couple of stone walls, and a few young pines on the forest floor below the towering ones. The trail splits and narrows, here we stayed to the right and soon came to another trail intersection where we stayed to the right once again. At the next intersection we stayed to the left slightly and then continued straight. The trail to the right would lead you back to Burnt Sawmill Road. Continuing ahead we came to a cellar hole and well on the left. It is not easy to see from the trail and if you do find it, be sure to use caution by the well. The next highlight of the hike comes up on the right. It is the Sweet Family Cemetery with graves dating back to the 1750’s. The trail then passes through another pine grove. This one is quite noticeable as the trees have grown very densely close to each other. Soon after there is a spur trail on the right that leads to the dam on the north end of Sweet Pond. The dam is now breached, intentionally, and Sweet Pond is no more. It is now just a stream through a grass filled basin. Retracing steps back along the spur trail we then turned right, southerly, along the trail we were previously on. Next we came to Sweet Sawmill Road, another old road. 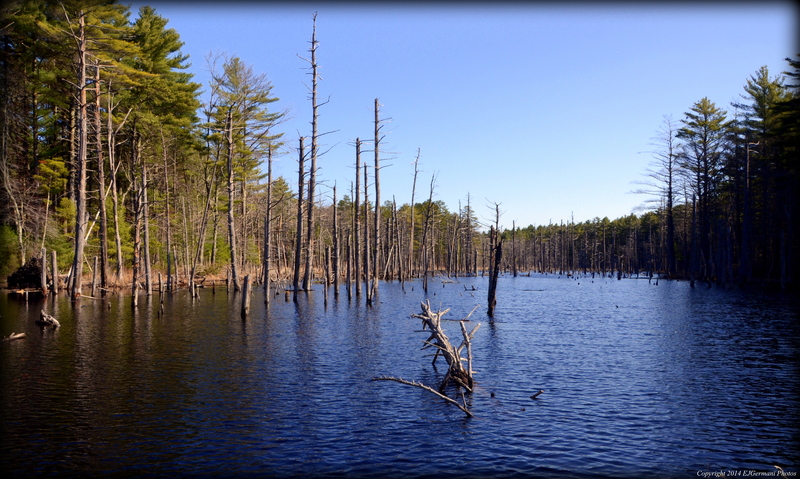 Here we turned right and soon passed the south side of the remnants of Sweet Pond. This stretch is flanked by some stone walls and ferns. At the next intersection, a four way, continue straight ahead. A few hundred feet ahead at the next intersection turn right. This is Burnt Sawmill Road once again. Following this road to its end will lead you back to the parking area. Along the way we would come across another cemetery and a former homestead with the only evidence left being a tire swing. Before concluding our hike we did explore a trail to the right that led to a stream that flows between the former Sweet Pond and Capwell Mill Pond. Wildlife is abundant here as it is not uncommon to see deer, coyote, squirrels, chipmunks, and turtles. The property also is carpeted by ferns and wildflowers with birdfoot violet and wild geranium being in bloom at the time of this hike. This is a popular hunting location as well. Orange is mandatory during hunting season. I have been exploring lesser known areas of the State Management Areas the last couple of hikes and I am convinced that the wildlife are quite content with being in these areas. Being mid to late afternoon I was surprised to run into deer. Not just one, but several. And furthermore, they didn’t seem to concerned of my presence. For this hike I followed a trail into the Big River Management Area from the bend on Fish Hill Road. Following the trail south I passed a sandy area to the left while making my way to the first split in the road. Here I turned left and then continued straight passing a cart path to the right. With a map in hand I intended to loop the pond, but soon found that the pond had overflowed onto the trail. At the time of this hike it was impassable. So after a quick peak at both Reynolds Pond and Big River I retraced my steps back to the last intersection. Here I turned left and followed the cartpath for a bit before making another left. This trail leads down to the southern side of Reynolds Pond via a trail that runs along Big River. Soon I was just shy of the spot I was before that was overflowed. From here I retraced my steps back to the car. Besides deer, I saw turtles, chipmunks, various birds, and kayakers!! It is highly suggestible to obtain a copy of the Great Swamp Press map of Big River before making your way into the area. This would be my third excursion into the Big River Management Area. 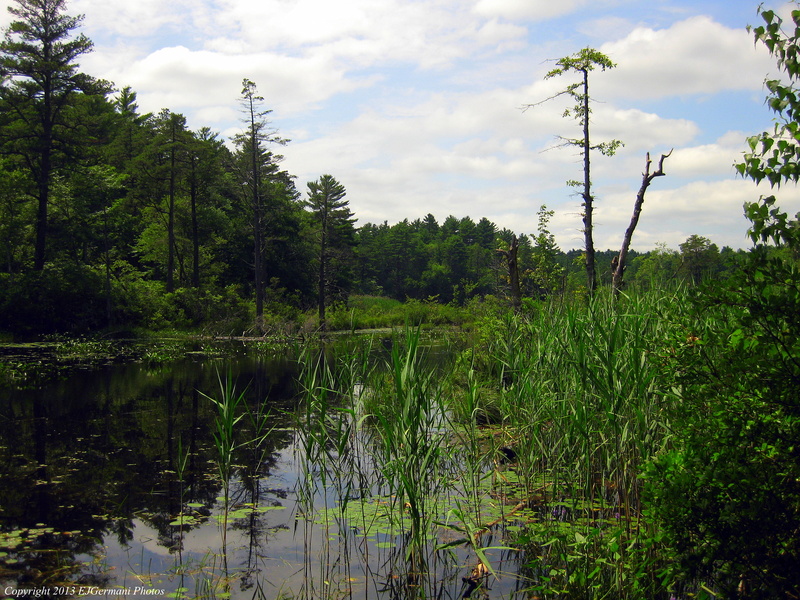 Last summer I had hiked Carr Pond and Hungry Hill on this property. As with all of Big River a map is a must and GPS is highly recommended as there is a tremendous maze of unmarked trails here. With that being said I began this hike with my Great Swamp Press map in hand from a parking area on Hopkins Hill Road. Two trails lead away from the parking area. I took the one to the left. (The one to the right will take you to Carr Pond). I followed this trail downhill first overshooting the turn I should’ve taken at the first major intersection. You should turn right at the first major intersection (currently marked with orange flagging). I then followed this trail and it veered left to a stream crossing followed by a small hill with another stream crossing on the opposite side before reaching a very large rock outcrop. At the outcrop there was a very large “camping” area with makeshift benches and fire pit. A marking in a tree called off the stop as Indian Rock. I then followed a narrow path off to the left that followed the edge of a peninsula before winding back to a wider dirt road. At the road I turned left and followed it nearly to its end. I then turned right at what appeared to be a T intersection with a trail leading off to the right and uphill. After crossing the top of the hill the trail descended to its end onto the abandoned portion of the New London Turnpike. At the turnpike I turned left crossing an overflowing area of marsh before turning left at the next trail. Along this trail I came across an old brick building with some very positive graffiti scrolled across the facade. At the end of this trail I turned left onto the next trail keeping the marsh in sight. Toward the end of this trail a vast network of minor trails meander in and out of the area. I found myself following the trails closest to the marsh and pond while heading in a westerly direction. There were many great sights in this area including some handy work by beavers as well as their dams. There were also some spots with wide open views of the pond and marsh. I also came across a pair of ducks in flight (who apparently knew I was trying to capture a photo of them… I failed!). This area is well worth exploring but be sure to keep your bearings. I eventually made my way back to Hopkins Hill Road via small trails following the edge of the pond. At the road I turned left over a small dam and then left again onto a trail that led back into the woods. I followed this trail to the second intersection (after a stone wall). At this point I turned right and uphill back to the parking area. Keep in mind this area is open to hunting and orange should be worn during hunting season. 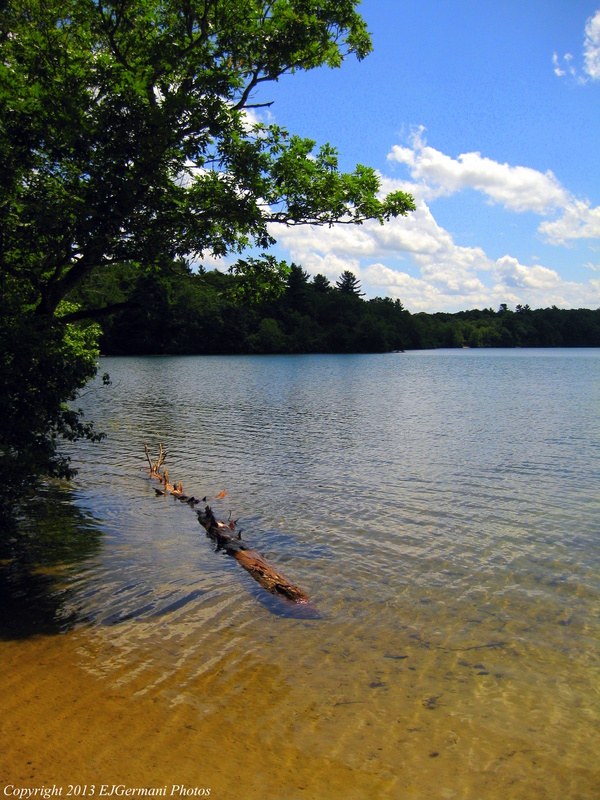 Trail map can be found at: Tarbox Pond. This hike was my second venture into the Big River Management Area. It was a perfect summer day and this was a perfect hike for the day. Starting from a parking area on Hopkins Hill Road I took the trail to the right into the woods. The path descended down toward the pond passing an old rusty car and an area of swamp before reaching the main loop trail. The path generally goes straight following red blazes (there are several other color blazes along the way and side paths, be sure to follow the red). When I reached the main loop trail I decided to follow it to the left. The loop, an old dirt road, is well traveled and quite wide. You will want to follow this around the pond. There are several paths and trails leading away from the pond to the left of the main trail. I would advise not to wander too far without a map or a GPS device on these trails. Big River has an immense network of unmarked trails. The paths leading to the right of the main trail lead to areas overlooking and along the shores of the pond. Some even lead to small beaches. (No swimming allowed here). The views of the pond at these trails are spectacular. After checking some of these trails I continued along the main trail, passing some old stone structures and pipelines, until I reached the trail I entered the area on. It is marked with a large boulder on each side of it and at the time of this hike marked with several orange arrows. I then followed this trail back to the car. 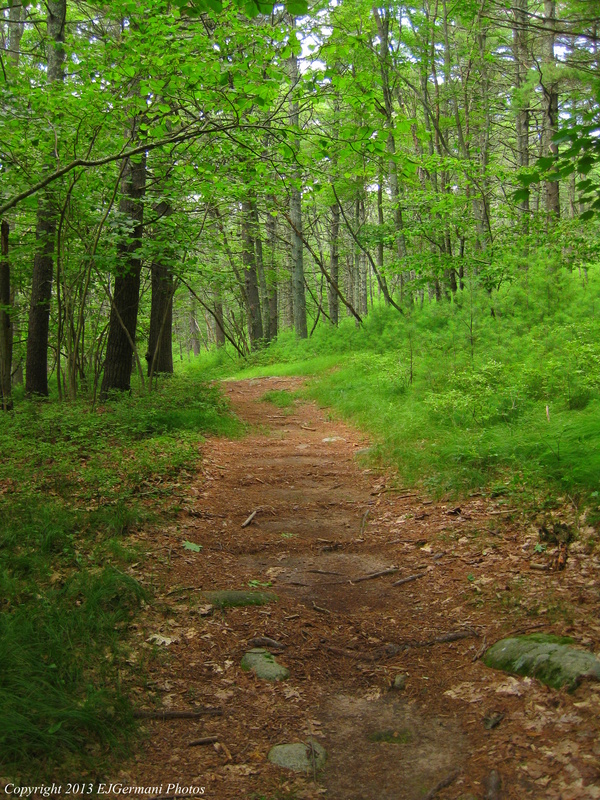 (Remember to follow the red blazes) I came along several butterflies on this hike as well as birds and squirrels. This was my first venture into the Big River Management Area. I had bought a Great Swamp Press map of the management area a while back and found several potential hikes. Hungry Hill seemed to be a good start. Starting from the parking lot at Zeke’s Bridge Fishing Area I crossed Harkney Hill Road to the beginning of the trail next to utility pole #36. Following the trail into the woods I took a left at the first split and started the climb up the hill. The trail to the right I would return on. Continuing up the hill there are a couple trails to each side. I continued straight until the trail ended at a “T” intersection. At this point you are about a half mile in and most of the significant climb is done. I then followed the trail to the right heading in a southerly direction. This is the higher trail of the two main trails. 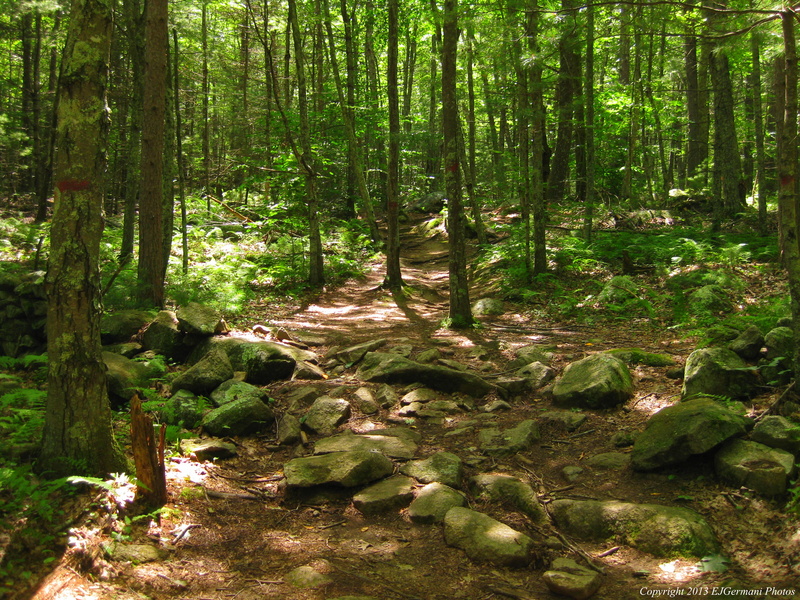 This is a long and peaceful wooded section of trail with the summit of Hungry Hill to your left. (There is no actual trail to the top of the hill.) As you approach the end of the trail you can start to hear the buzz of traffic. Interstate 95 is ahead. At the end of the trail is another “T” intersection. I turned right going downhill for a rather short distance, then right at the bottom of the hill heading now in a northerly direction along the lower trail. This trail continues downhill and toward Big River. There are some rather low and muddy spots along the way after a rainy day and can be buggy. There are a couple of loop trails to the left off the main trail that bring you to the rivers edge. Unfortunately, I did come across some areas of trash and litter on the lower trail, but that aside, this was a nice walk. Continuing north along the lower trail I came to the first split and then retraced my steps along the entrance trail and back to the car. I did come across several frogs here. I did not see the bear that was spotted in this area last week.